“A Gentleman in Moscow” is now perched right at the top of my ‘hug worthy’ pile of books and I don’t feel like anything else is ever going to nudge it out of it’s no.1 position. That’s a big call, I know, but that’s how much I loved this book. Not since reading Gabriel Garcia Marquez’s ‘Love in the Time of Cholera’ have I swooned from page to page, stopping at the end of many sentences to blink back the tears stirred by such beautiful language and then frantically reaching for my notebook to scribble down the passages which have taken my breath away. I’ll confess that Russian History really doesn’t do it for me whatsoever and I was extremely reluctant to give this novel a crack, assuming it was going to be a bit heavy handed on the political detail, possibly a little too ‘high-brow’ and generally just down right stuffy and boring. It also has footnotes, which for me, often stirs up all sorts of irrational fears but they are so seamless and well done that I had nothing to worry about whatsoever. Oh how wrong I was in my negative assumptions! 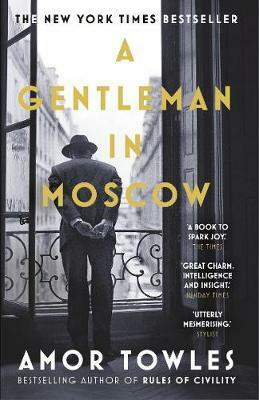 The novel just sings with so much joy, humour, delight and vivid detail – the characters are so real and endearing, particularly the main character, Count Alexander Rostov, deemed an unrepentant aristocrat by the Bolshevik Tribunal and sentenced to house arrest in the Hotel Metropol. The Count is a man of measured philosophical musings, a true gentleman with impeccable manners and a nature of bottomless empathy and kindness for all staff and guests under the roof of the hotel. I will say that this novel isn’t an easy read. It is dense with so much detail and clever, witty dialogue that you really need to give it lots of time and energy – but the rewards are infinite! This is such a special novel. Like an old friend or a dear pet, I keep going back to my copy and giving it a hug and a pat and chuckling away while reading my favourite passages, so much so that I think I’m almost driving Sue nuts with my incessant declaration of love! Also, don’t even think about downloading it – this is a book that you absolutely MUST have in it’s physical form (I could argue that all books are but, time and place…) You’ll want to revisit this novel again and again before gracefully shoving it into the arms of your fellow bookworms so they too can share in the endless joy and sheer delight that reading this novel will bring.